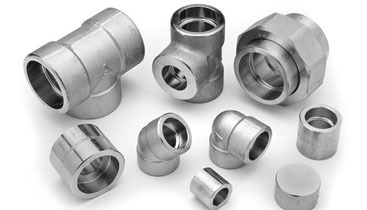 Jaydeep Steel is a leading Manufacturer, Exporter, Supplier, and Stockiest of Alloy Steel Socket Weld Fittings to both national and international clientele. We supply Alloy Steel Threaded Forged Fittings are the best-preferred fittings for installation of pipelines and conform to international standards. It includes Socket Weld Elbow, Socket Weld Tee, Socket Weld Reducer, Socket Weld Return Bends, Socket Weld Stub-Ends, Socket Weld Collar etc. These AS Socket Weld Forged Fittings are best suited for sensitive applications in power generation and nuclear industries to handle toxic materials that are harmful to human and animals if leaked. Ensure easy and quick installation of the pipelines, these pipe fittings are available in wide sizes and pressure ratings with choice in surface finish. 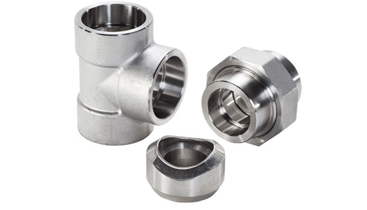 Our socket weld fittings are made up of high-grade alloy steel material and which can also be available in various grades and have precise size, weight, thickness, and dimension. Our manufactured alloy steel forged fittings are preferred owing to its features like durability, high metallurgical strength, tolerance. Contact us today to request a free estimate today! Jaydeep Steels stocks a wide range of materials and grades. Below are a list of all standard Alloy Steel socket weld fittings materials and grades we stock. Our experienced team of metal experts will get you the metal you need when you need it. Call us today for your Alloy Steel Socket Weld Fittings Needs!